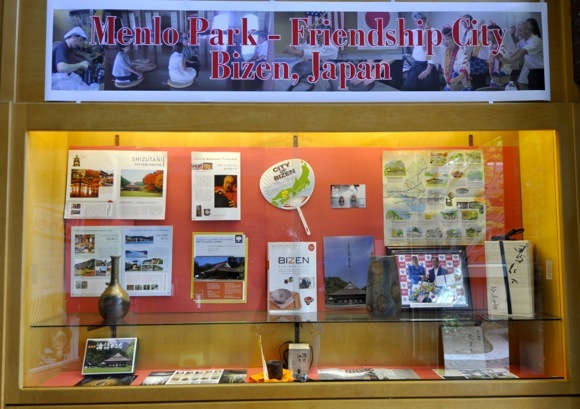 During the month of March, the display case at the Menlo Park Library entrance features two of Menlo Park’s friendship cities: Galway City in Ireland and Bizen in Japan. The signing of a friendship agreement with Galway City in 2013 was the culmination of over 50 years of official and unofficial contacts between the two cities. Menlo Park’s name is taken from the name Dennis Oliver gave his ranch in the early 1850s because the bucolic countryside reminded him of the small village of Menlo that was then just outside of Galway City where he grew up. Councilpersons Ohtaki and Carlton have both made official visits to Galway (2013 and 2015 respectively) during their tenures as Mayor, reciprocating the visits here of Galway Mayors Conneely and Lyons. Galway City and Menlo Park are expected to become official Sister Cities sometime this year. Under Mayors Mueller and Carlton, Menlo Park has recently established friendship or cultural exchange agreements with three additional cities: Kochi, India; Changchun, China; and Bizen, Japan. After Menlo Park hosted a student group from Bizen in 2015, some Menlo Park students are planning a reciprocal visit to Bizen this year. The City of Menlo Park is proceeding to further organize these ongoing relationships by forming a Sister City and Friendship Committee. Applications are now being taken (deadline March 31, 2016) for five positions on the Committee: three for residents and two for business representatives.